CEO and founder Filipe Pedroso, Esq. 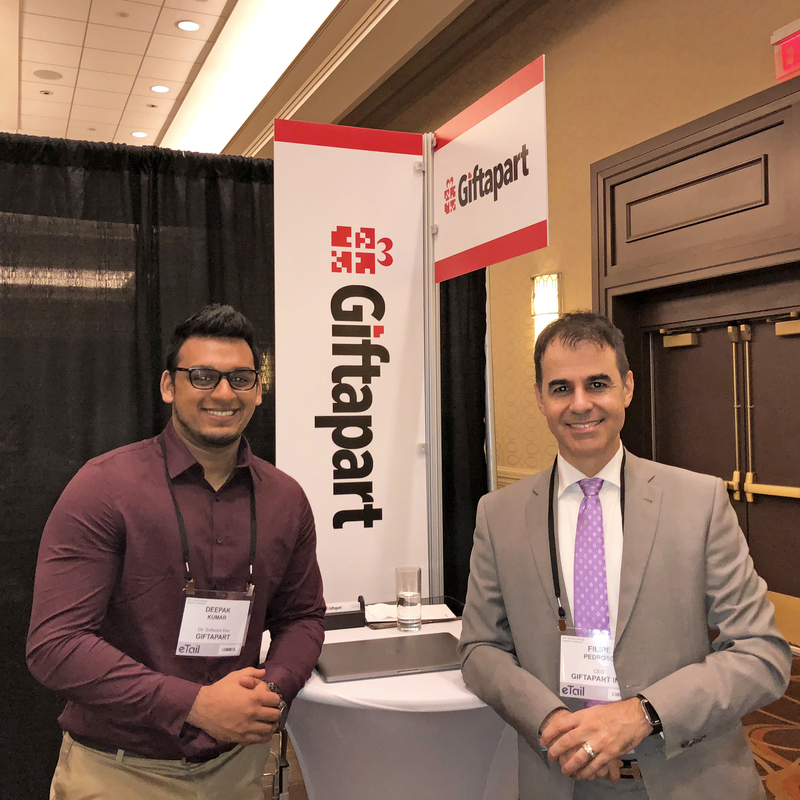 (right) with Deepak Kumar, Director of Backend Software Development, exhibiting and demoing Giftapart to the retail community at eTail East in Boston. SOMERVILLE, NJ, August 13, 2018 — Giftapart Inc. introduced retailers to the “world’s first truly retailer-friendly and fair ecommerce marketplace,” as described by its founder and CEO Filipe Pedroso, Esq., at eTail East in Boston. “Many retailers were very interested in learning about Giftapart. Select retailers were invited to view a demo of the platform. Our marketplace is the best place in the world for retailers to engage, connect and sell to a growing Gen Z and Millennial demographics,” said Pedroso. “Why do we say that we’re the most retailer-friendly and fairest ecommerce marketplace in the world?” asked Pedroso, “For several reasons. First, we don’t allow third-party sellers on our platform. In a recent Federal government study, it was found that third-party sellers often sell counterfeit merchandize. Certainly, counterfeit products can be sold below the break-even point of authentic products. Our model also benefits the consumer, because I believe that consumers want an internet marketplace to shop that they can trust. “Second, we give retailers a large toolbox of connectivity tools that are entertaining and engaging to help them build and expand their customer base like never before. Third, one of our proprietary selling methods is one of the world’s first ways of selling online that doesn’t focus on shrinking margins. Retailers interested in finding out more about partnership opportunities can contact Giftapart at biz@giftapart.com. Inquires are accepted from established retailers. Text and pictures available at: https://info.giftapart.com/news/news20180813.html. Giftapart Inc. is developing an innovative and revolutionary new way for e-commerce. The company was established in 2017 and is headquartered in Somerville, New Jersey. The company’s software systems and methods have resulted in the filing of numerous provisional patents. Giftapart is led by award-winning attorney and 3-time elected Councilman Filipe Pedroso, Esq., Founder, CEO and Board Member, as well as its other Board members: Liana Pedroso (a public relations and corporate communications expert with international experience and Master’s Degrees in the field from both Bashkir and New York University); Jeffrey Vanderbeek (prior owner and Chairman of the NJ Devils NHL franchise and The Prudential Center; and former Managing Partner responsible for Capital Markets at Lehman Bros.); Jeffrey Foose (Managing Partner of AERIS Capital, with extensive experience in tech startups, commodity investments, management, software development and accounting); and Henrique Pedroso (a serial entrepreneur and law school graduate, grew and led his businesses with hundreds of employees from the ground-up into successful ventures). Company social media platforms: Facebook, Instagram, Twitter & LinkedIn.